Your bathroom is a sacred space for rejuvenating and relaxing. It should function as a place where you can prepare for the morning ahead or unwind at the end of a long day. Every bathroom in your home should balance form and function, expressing your personal aesthetic while providing the means and space to cater to your day-to-day routine. The highest quality renovations require an expert eye—especially bathrooms. There are a broad range of mistakes homeowners and less experienced renovators can make during a major remodel. As much as we love focusing on the positive aspects of bathroom renovations, we think it’s worthwhile to share some of the most common errors we’ve seen. It is crucial that each task in a remodeling project is completed with precision from start to finish. After all, any renovation is a worthwhile investment in your home when done correctly. What Should You Avoid When Remodeling Your Bathroom? This might sound obvious, but it’s a very common problem that can have disastrous consequences. We get it—homeowners are always excited to see the final product. You may be eager to see your transformed bathroom, but it’s important to avoid racing to the finish line. Rushing a renovation can lead to a number of serious consequences. Not only do you risk making a series of poor decisions, but you may overlook a number of invaluable opportunities that could lead to a higher quality product. More often than not, rushing through a project creates expensive and inconvenient long-term issues. Before you begin any luxury renovation, it’s important to establish a budget with a working price range. You never want to find yourself sacrificing quality for cost-savings—especially during a bathroom remodel. Cheaper product options may seem cost-efficient, but in the long run, you’ll ultimately be saving money by making the initial investment in quality materials. A higher sticker price is far less expensive than repeated repairs and replacements you’ll need to make down the road. Will extra storage space be necessary? 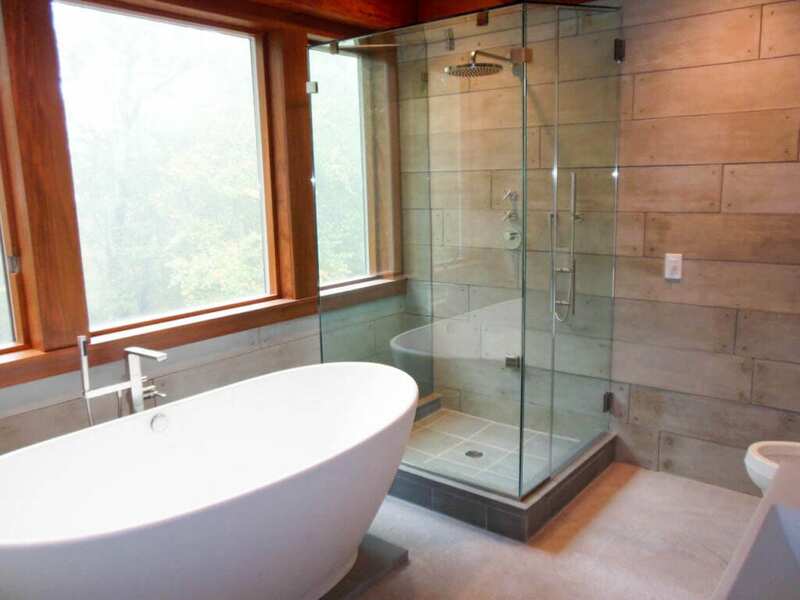 Can you get by with just a walk-in shower, or will a tub be needed? No one wants the details and fixtures of their newly remodeled bathroom to go unnoticed because of poor lighting. When you’re planning your renovation, think about how much light you would like throughout the bathroom. Clear and visible lighting is essential when getting ready in your newly transformed bathroom. Consider all of your vanity lighting options as well as any natural lighting opportunities. Natural light is the most flattering—and the most pleasant—light for bathrooms. Windows and skylights are great ways to incorporate natural sunlight. Be sure to discuss all of your natural lighting options with your remodeler to ensure your bathroom has ample lighting. Not all builders operate at the same level, and not all have your best interests in mind. The key to a quality luxury bathroom renovation is finding the right-fit renovation firm to work with. Take the time to research potential contractors by viewing their work, reading reviews, and taking the time to discuss your goals with them. With over 35 years of professional experience as the premier luxury renovation firm in Westchester County, NY and Fairfield County, CT, we know exactly what it takes to create the highest quality bathrooms. If you’re interested in working with a team of renowned architects, designers, engineers, carpenters, plumbers, electricians, roofers, tile/granite/marble installers, wood floor specialists, and masons, get in touch today.